Τransform your business to a well known brand with engaged customers. Your logo is your sense of style and we make sure it represents the aesthetics of your business. Besides your logo, we also create your leaflets and price lists, all designed strategically to highlight your business’s points of difference. To make your business presence bold, no matter the competition, what you need is a carefully designed brand identity and strategy. Brand identity is shaping who you are and brand strategy is managing who you are in the way that works the best for you. Knowing your competition is a strength, but also very time consuming. We provide you this strength of knowledge by doing a research about your competitors and finding out how you can outrun them, revealing the true potential of your business. 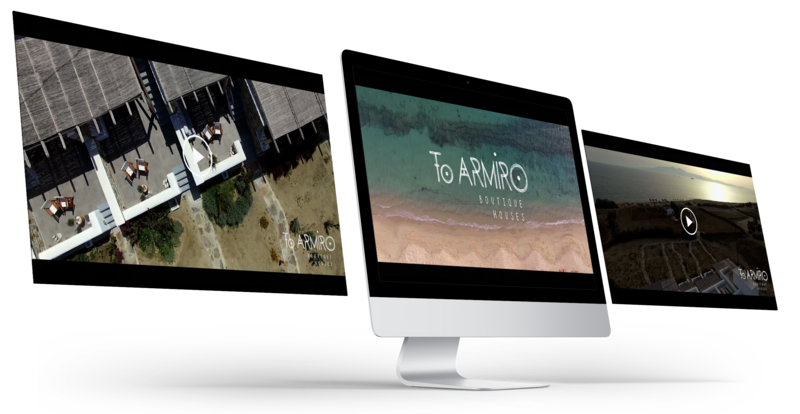 Producing amazing movies for your business is one of our specialties. We take care of every detail - from the actors and the models to the technical equipment to ensure the best result possible. Branding is the way you present your brand to the world, visually and verbally. It doesn’t matter if you run your business for many years, or just a few months- it is always a good time to take care of your business’s branding and ripe the benefits. Running a business, requires Branding on its own. The way you are seen by people and the way you engage with your customers are just some of the aspects of your business that a good and strategical Branding can boost, revealing another perspective of your hotel and increasing your profits. Why to choose us for your business’s Branding? We have almost 20 years of experience in hotel branding and our customers can confirm the results we achieve. Together, we create or recreate step by step your hotel’s brand and image, in order to drive it to success.